The implementation of the European Flood Directive 2007/60/EC requires the establishment of public participation mechanisms to ensure citizens’ involvement in the flood management cycle. This raises questions on how to achieve this goal and successfully translate the directive into meaningful and effective participation. Innovative means, such as citizen observatories enabled by information and communication technologies, have the potential to provide citizens with a substantially new role in decision-making. In this paper a framework is presented, developed for analysing the potential for participation via ICT-enabled citizen observatories and undertake a comparative analysis of the UK, the Netherlands and Italy. Expository and qualitative research was undertaken in the three case study areas, with the aim of identifying and comparing the transposition of the EU Flood directive and the mechanisms in place for citizens’ participation during different phases of the disaster cycle (prevention, preparedness, response, and recovery). The analysis of the transposition of legal obligations for citizen participation shows that implementation is limited when examining both the respective roles and types of interactions between citizen and authorities and the impact of citizen participation on decision-making. 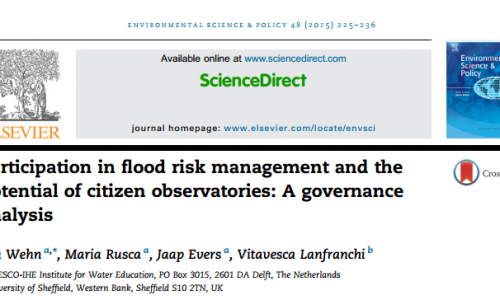 Different authorities have differing perceptions of citizen participation in flood risk management in terms of their roles and influence. The results also indicate that these perceptions are related to the importance that the authorities place on the different stages of the disaster cycle. This understanding is crucial for identifying the potential of citizen observatories to foster greater citizen engagement and participation. This article is written by Uta Wehn, Maria Rusca, Jaap Evers and Vitavesca Lanfranchi and was published in Environmental Science & Policy, Volume 48, April 2015.